On a recent trip down Island, I was pleasantly surprised to come across a new (to me) and exciting piece of North Island history. During a routine stop at the Sayward coffee and ice cream bar (beside the gas station on the highway), we happened upon the small sign for the gallery located in the rear of the building. Upon entry we were treated to numerous portraits and paintings, most of which were completed on round pieces of wood sawed off of the ends of logs - complete with bark attached. 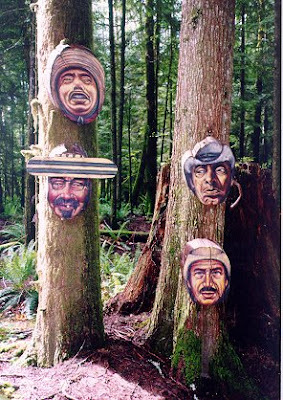 These looked familiar to me, as I recognized the faces as the same style as those which used to be more plentiful on the sides of buildings we would see from the highway while travelling through Sayward. When we dropped our donation in the gallery box the lady in the coffee shop commented how wonderful it is to now have a permanent home for so many of Hetty’s paintings. Of course this triggered my curiosity, and I had to do a little bit more research! Hetty Mulder – Fredrickson, the artist behind this prolific collection of paintings, is a familiar personality to many North Islanders. For 25 years she ran the “Valley of 1000 Faces” in Sayward, which was a popular roadside attraction. Hetty was born in Indonesia in 1921. Her family was originally from the Netherlands, but lived for an extended period of time in South East Asia.During WWII Hetty was attending school in Europe when the Nazis occupied the Netherlands, and the Japanese occupied Indonesia. For an extended period of time she had no contact with her parents. Eventually she married, and then divorced. Perhaps impulsively, without any concrete plans, she decided to pack up her two young sons and move to Canada. Initially settling in Montreal, Hetty accepted a housekeeping job in the remote BC interior, the pay being only room and board for her and her children. Unable to save any money she felt trapped and isolated. Hetty started looking through the want ads in the paper and found a job housekeeping and child-minding for widower logger named Douglas T. Fredrickson. The two eventually fell in love and married. During this period Hetty resumed the painting which she had abandoned earlier in life. After a brief stint in Chilliwack, where the Fredricksons had the unfortunate experience of living in a house which was widely believed to be haunted, they moved to Sayward. In order to keep busy in the small logging community, Hetty offered painting lessons for the local children. She was also a prolific painter herself. To save money, Hetty’s preferred canvases were slices of logs. She was known to use common house-paint as a medium, and when paintbrushes were not readily available she would paint with her fingers. After painting a number of portraits, Hetty decided to hang them alongside the road. They caused a bit of a traffic jam as people stopped to look at them, and many were stolen under the cover of darkness. Hetty and her husband then decided to forge a trail through their 4 acre property, and filled the forest with portraits. Cars would pull off the road to visit the outdoor exhibit which took patrons through a rainforest trail. The attraction was called The Valley of 1000 Faces, and for the 25 years that it existed patrons were only charged $1 admission. 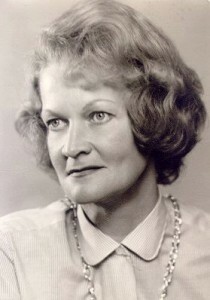 Hetty passed away in 1994, and we are lucky that when the property was sold residents of Sayward had the foresight to collect and save a large number of Hetty’s paintings. They are now accessible to all in the little gallery behind the espresso and ice cream shop just off the highway. Please stop in and take a moment to view this lasting piece of North Island history – and don’t forget to leave a donation. A wonderful short film has been made about Hetty Fredrickson's life and is available on-line here: https://vimeo.com/31637357. What are the painted faces on burls worth today? I have had two faces (one Indian male with headdress and one Indian female) brought into my consignment shop and have no idea what to put on them for price. Not able to find any info on the computer. Thank you. Hi there, I am a former resident of Sayward and former employee of Hetty's, to be honest back in the 80's the paintings would go for roughly 150.00 to 600.00 that is just a rough estimate from memory as I was in my teens at the time. My best guess for insurance purposes i would most likely say upwards of 1500.00 2000.00 however that is a guesstimate think about having it appraised. I have a "spirit face" we purchased from Hetty's husband when he reduced the size of the exhibition. I know it went to Japan when she took a selection of her work there. I would like some information on the best way to preserve it as the edges are not in good shape now.